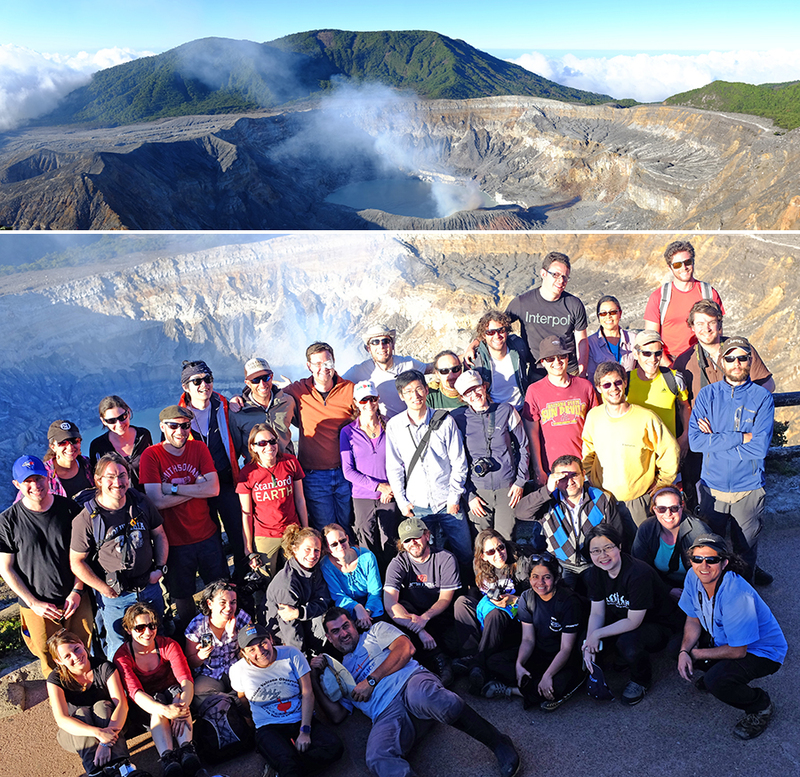 The First DCO Early Career Scientist Workshop was held at the University of Costa Rica in San José in February 2014 and brought together more than forty early career deep carbon scientists from around the world. 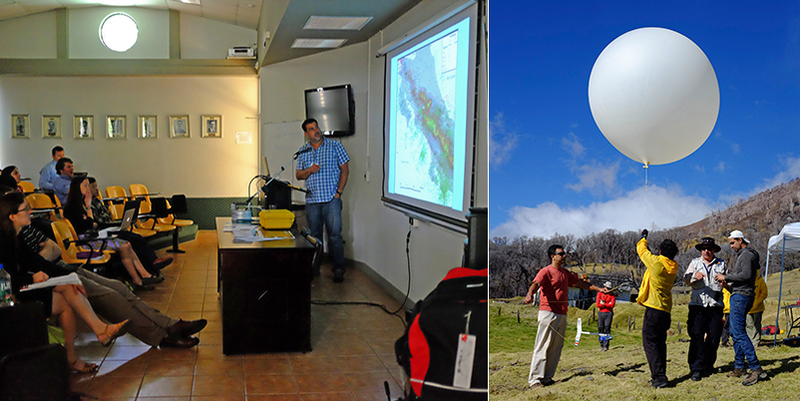 The University of Costa Rica in San José played host to the 1st Deep Carbon Observatory Early Career Scientist Workshop 18-21 February 2014. This week-long workshop, sponsored by the Alfred P. Sloan Foundation, Elementa, Technodiamant, Almax easyLab, and PLOS ONE, brought together more than forty early career deep carbon scientists from around the world. Equal parts scientific talks and fieldwork, the workshop was designed to cultivate new collaborations and initiate a network of early career scientists within DCO. Jon Fellowes (University of Oxford), chair of the organizing committee, kicked off the workshop with an overview of the Deep Carbon Observatory program and decadal goals. Workshop co-organizers Aude Picard (Deep Life, Harvard University), Long Li (Deep Energy, University of Alberta), and Taryn Lopez (Reservoirs and Fluxes, University of Alaska Fairbanks) then introduced the specific goals of their respective communities. Unfortunately Wendy Mao (organizing committee member and Extreme Physics and Chemistry Co-Chair, Stanford University) was unable to make it to Costa Rica, but Dan Hummer (Extreme Physics and Chemistry, University of California, Los Angeles) stepped in and introduced the work of this community in her place. Day one continued with talks from the Deep Life, Deep Energy, and Extreme Physics and Chemistry communities. All the speakers provided overviews of their work that were suitable for the diverse audience in attendance, and in the spirit of collaboration, many highlighted areas in which they envisioned collaboration across DCO communities. Priya Narasingarao (Deep Life, Scripps Institution of Oceanography) showed data from fluids collected in the deep gold mines of South Africa by fellow workshop participant Borja Linage-Alvarez (Deep Life, University of the Free State), highlighting a DCO collaboration that is already yielding results. This workshop was the first opportunity for these collaborators to meet in person. The first day concluded with a social evening at the Gran Casa Universitaria, a large guesthouse where all the attendees stayed, with lively discussions continuing well into the night. The morning of day two saw the Reservoirs and Fluxes Community take center stage to prepare the group for two days of fieldwork on two of Costa Rica’s famous volcanoes. 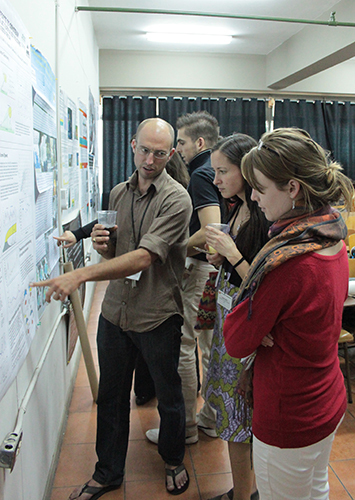 A number of the attendees perform research in Costa Rica to better understand the deep carbon cycle. Their talks highlighted what is currently known about the inner workings of these volcanoes. Tefang Lan (CRPG-CNRS) highlighted some unusual new data, and as she pointed out that working with a skilled theoretical modeler would be particularly helpful, Raffaela Cabriolu (Extreme Physics and Chemistry, The George Washington University) piped up and offered to help. Dr. Jorge Andres Diaz (GASLAB, Department of Physics, University of Costa Rica) gave the workshop’s keynote address. 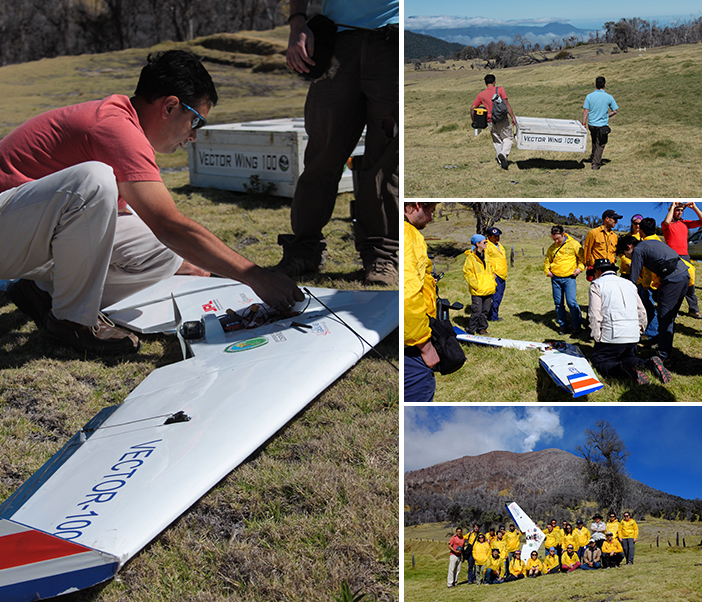 His fascinating presentation detailed years of work to perfect remote sensing of volcanic degassing, and introduced the miniaturized instruments and custom-developed unmanned airborne platforms he would demonstrate during the field trip to Turrialba. Carlos Ramirez Umaña (Department of Geology, University of Costa Rica) prepared everyone for two days in the field by showing incredible footage of sulfur flows and eruptions captured by him and his fearless team as they led sampling expeditions to the summit. Clare Dean (Elementa: Science of the Anthropocene), a representative of one of the workshop’s generous sponsors, talked about open access publication in Earth sciences. Katie Pratt (DCO Engagement Team, University of Rhode Island) introduced DCO’s ongoing outreach activities, and with the help of Claire Cousins (Deep Life/Reservoirs and Fluxes, University of Edinburgh) shared tips for filming video footage in the field to prepare everyone to use several GoPro cameras provided by the workshop. After the hour-long breakout sessions, in which participants provided feedback about the DCO program, as well as the workshop itself, everyoneenjoyed the many posters on display. While participants had been encouraged to keep their talks relatively general, the posters allowed them to discuss the fine detail of their research. Karine Nedoncelle’s (Deep Life, UPMC – Paris VI) poster “Shell growth rate and habitat variability of the hydrothermal vent species Bathymodiolus thermophiles” was voted the best poster of the workshop. At seven in the morning on day three the group set out on the first of two field trips. Carlos and his team from the University of Costa Rica led the group up Turrialba Volcano, along challenging roads, in several trucks and a surprisingly nimble minibus. Due to the number of helmets and gasmasks available, the group was split in half, with twenty people heading up to the summit with Carlos, and twenty remaining several hundred meters below at Dr. Diaz’s launch site. At the summit, 3,400m above sea level, participants were treated to stunning views before hiking out along the edge of the crater. Francesco Cappecchiacchi (Reservoirs and Fluxes, University of Florence) and others headed down into the crater to sample gases directly from the fumarole, while Maarten de Moor and Geoffroy Avard (Reservoirs and Fluxes, OVSICORI-UNA) demonstrated their multi-gas instrument while walking through the plume. Five hundred meters below, Dr. Diaz led several launches of his airborne equipment to assess degassing from Turrialba, and deployed a helium-filled balloon capable of sending up to two pounds of gas-monitoring equipment into the plume. 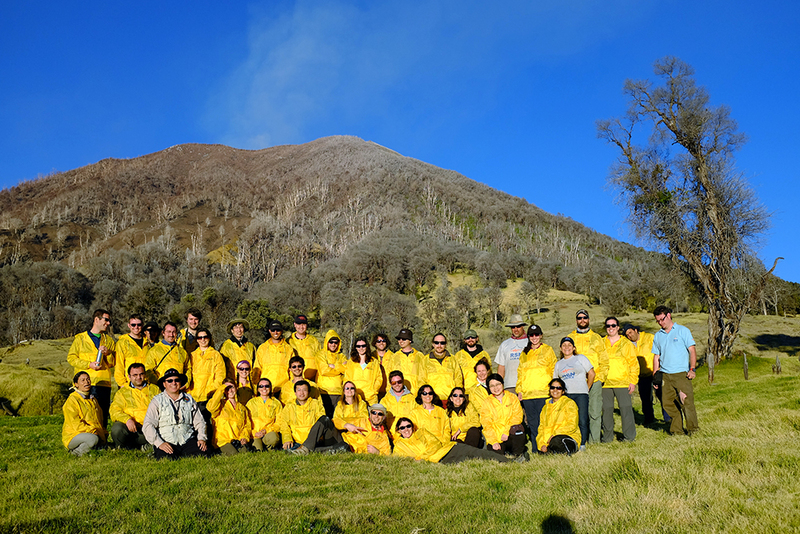 Once the entire group was reunited at the end of the day, everyone donned their yellow DCO field jackets for a group photo against the wonderful volcanic backdrop. The evening was again devoted to socializing at Gran Casa, with a large barbecue on the balcony. Despite some sunburned faces, conversations continued deep into the night. On day four, everyone piled back into the trucks for a final day in the field. The first stop, near Póas Volcano, was at a CO2 well which is currently producing large volumes of gas for soda carbonation. Nearby, a local homeowner allowed everyone onto his property to investigate the bubbly, degassing swamp in his backyard. Carlos also led the group to a Nyos-type lake, where stratified water represents a seasonal hazard to local wildlife when acidic, CO2-rich water rapidly turns over from the depths to the surface. As a final treat, the participants travelled to the top of Póas Volcano where they were greeted by another beautiful vista across the vast caldera. The major goals of this workshop were all met, exceeding the expectations of the organizing committee, who had the pleasure of witnessing new collaborations and friendships bloom over the course of the workshop. Many participants expressed a strong desire to meet up again, with conversations already underway about the future of collaborative activities within the DCO Early Career Scientist network. Photo credits: Aude Picard and Katie Pratt. For more photos, visit Flickr or Facebook. Download the workshop briefing book. Further reading: Blog posts from attendees Claire Cousins and Melitza Crespo-Medina.